8mm orange kernmantle rope for use with 3700 descent device. Rope has polyester/Technora sheath and Technora core which is fire resistant to 925°F. 50ft. length. Minimum breaking strength 5,500 lb. Jaco Aerospace and Industrial is your one stop resource for 3M(TM) and DEUS(TM) 8mm Kernmantle Rope A2W-8.0-50, Orange, 50ft. Length, 1 ea and all of your 3M Products, Tapes, aerospace and industrial needs. 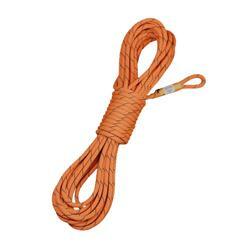 SKU Marketplace Product Description: 8mm orange kernmantle rope for use with 3700 descent device. Rope has polyester/Technora sheath and Technora core which is fire resistant to 925°F. 50ft. length. Minimum breaking strength 5,500 lb.